Spectrum Signal Processing by Vecima uses Green Hills Software�s INTEGRITY real-time operating system (RTOS) and MULTI integrated development environment to deliver solutions for the communications and signals intelligence markets, including applications such as multichannel transceivers and wideband jammers. 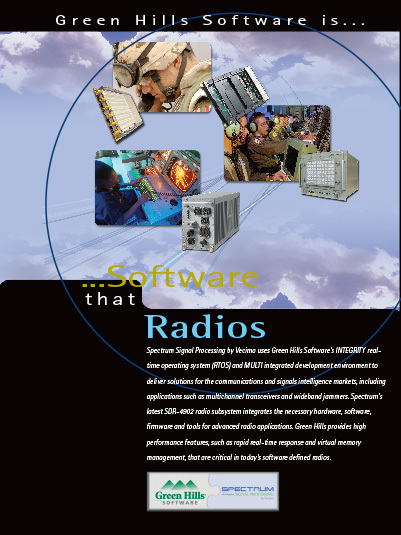 Spectrum�s latest SDR-4902 radio subsystem integrates the necessary hardware, software, firmware and tools for advanced radio applications. Green Hills provides high performance features, such as rapid real-time response and virtual memory management, that are critical in today�s software defined radios.